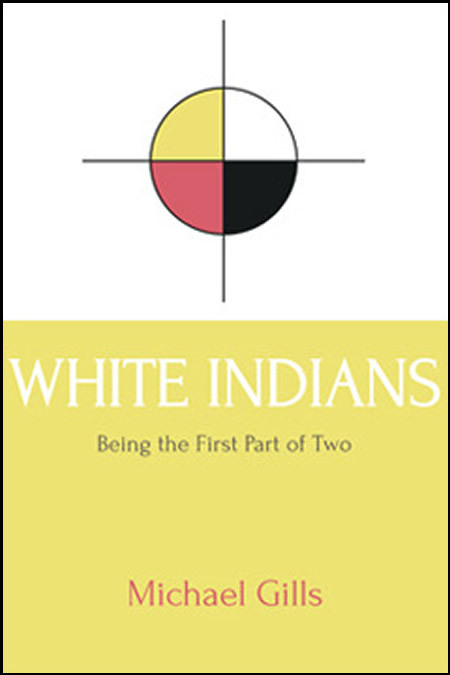 White Indians, a “visionary memoir,” recounts Gill’s experience as a participant at a Native American Sundance ceremony on Zuni Territory, New Mexico, during July 2005. The ceremony unfolds on a wolf refuge at night. Sixty men and women dance and pierce themselves during four days, offering flesh to a 90-foot tall cottonwood, wrapped and glimmering with thousands upon thousands of prayer ties. The breathtaking pageantry of the dance is offset by the shock of seeing flesh offerings taken in the splendor of elaborate costumes and the continuous drumbeat and singing under an enormous sky. As firekeeper, the narrator's responsibility is heating stones for the sacred inipi. Later in the dance, a scarred old heyoka (backward/forward man) ushers him into the arena where he moves among the dancers under the tree, riveted by every detail. The result is the first of a two-volume work seldom if ever seen in American Literature that places this ceremony in the larger context of Native American prophecy—the return of lost white brother and the end of the fourth world. MICHAEL GILLS is an award-winning author of several fiction collections and novels. He serves as Distinguished Professor of Writing for the Honors College at the University of Utah.